Just got the Death Proof soundtrack from Amazon and a new copy of the Criterion release of Equinox from someone on Amazon for $13! Best Buy had a TON of these. I might hang onto it and wait to sell it on eBay, unless someone convinces me that these films are totally worth watching. At first I was hoping that The Black Cat was the one with Lugosi and Karloff. It does have Lugosi, but it's a 1941 film with Basil Rothbone in it. They all sound kind of interesting though. Pilgermann, how much for that Universal Horror Classic Movie Archive. That's a nice set. MAN MADE MONSTER is an EXCELLENT movie! Lionel Atwill and Lon Chaney Jr! If I made a top 5 list of Chaney Jr. films...this would be on it!!! I'd buy it for that film alone! It was made right after Lon appeared in ONE MILLION BC and OF MICE AND MEN...and before the WOLFMAN. By the way, Volume 2 of their Universal Sci-Fi collection is back on their site, too. It's definitely worth getting. You know, one thing I positively hate about Prophecy above anything else in the movie is the "giant salmon." I really didn't get a sense that it was supposed to be freakishly big except that the protagonist just kept ranting about how big it was. Wrong Turn 2: Dead End (unrated). I liked the 1st one and I've heard some good things about the sequel so I picked up this 2 pack last night for only 14.99. Most recent purchase, I'll have to say: A Jet Li box with three of his worst movies + "Hero" for about 10 bucks... It was worth it solely for the Hero DVD! 1. "I, Zombie" ....which was OK, but a bit dated. ...and the jewel 2. "the Legend of the Seven Golden Vampires" which ruuulez the schooool!!! The latter I can highly recommend for anyone who likes horror + Shaw brothers... and who doesn't? "...and there was much rejoicing!" "Legend of the Seven Golden Vampires" is almost a given to be good, since they mixed a Hammer vampire film with a Shaw Brothers kung fu flick. I like that one a lot. There was more than one DVD release of that film, if memory serves. Which one did you get? There two I bought from Netflix for only $5.99 plus tax. Pretty sweet! Picked both up out of the 5.50 bin at WalMart. 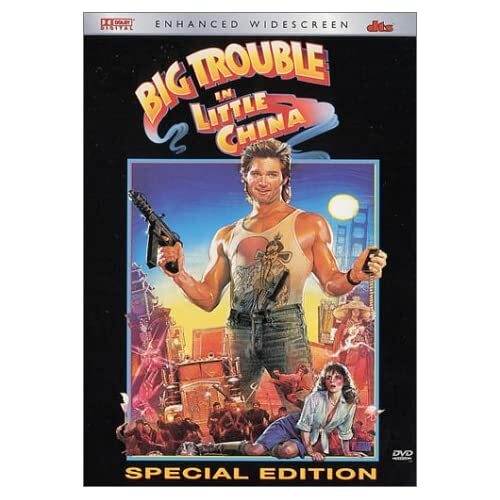 I think it was supposed to be the single disc of Big Trouble for 5.50 but it's the Special Edition. Where did you get that set at for that price? I saw the 2-pack at WalMart but it was 24.00 or so. I'd certainly pick up the set for 14.00! I got it at a Wal-Mart up the road from my house. They must've had it priced wrong in the system as a friend of mine went up the following day and they had it at 23.99. They do that a lot at this particular one. They had the individual DVD of part 2 for 14.99 and my guess is that someone entered in the 2 pack at that price incorrectly before they had put them out.